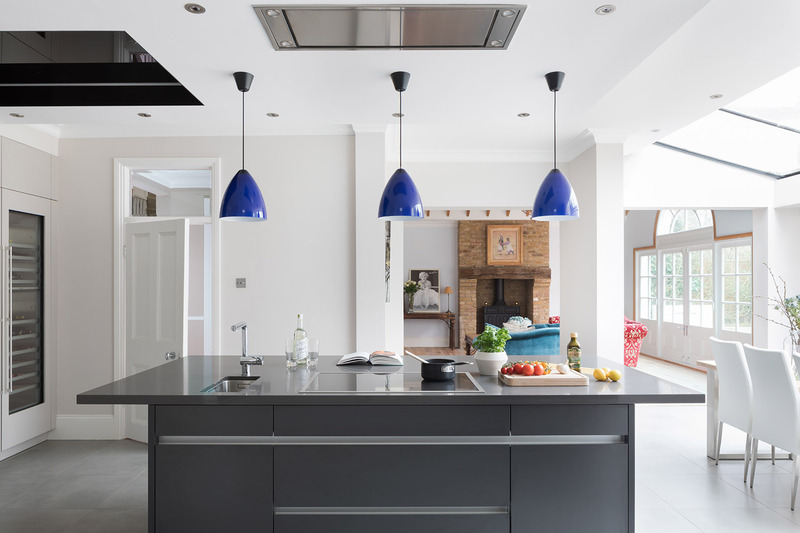 The main objective was to design a kitchen that reflects a social and entertaining atmosphere for the client to enjoy with family and friends. 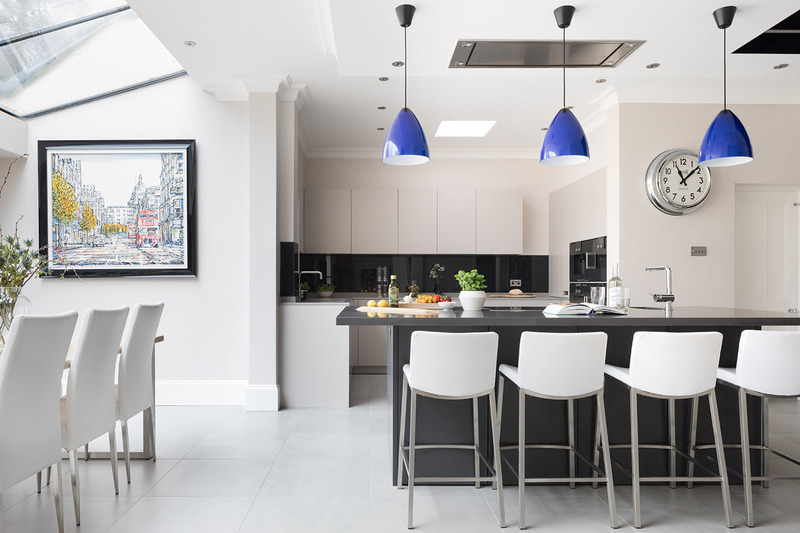 The key focus was to create a stylish and modern design that included accessible working areas and an open plan living area. 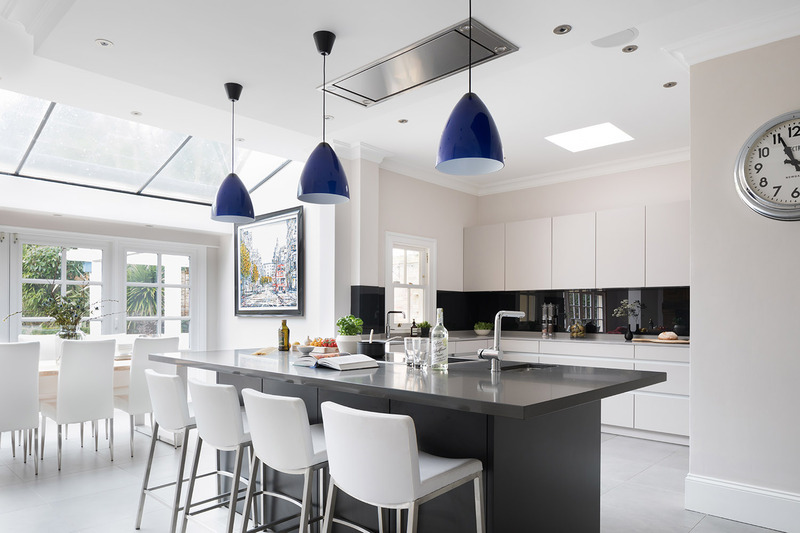 Mr Mcaleer was keen to retain the traditional room cornice and French Doors leading to the garden whilst using a light colour scheme that would create a sense of space. 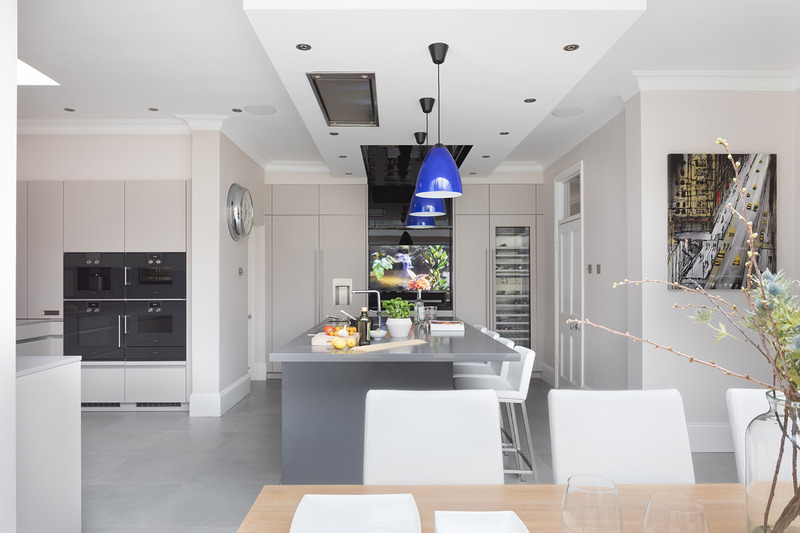 The kitchen and living area are linked together by the island, which creates a focal point in the centre of the room. The use of muted tones throughout and the addition of colour with light fixtures and soft furnishings also link the space together. 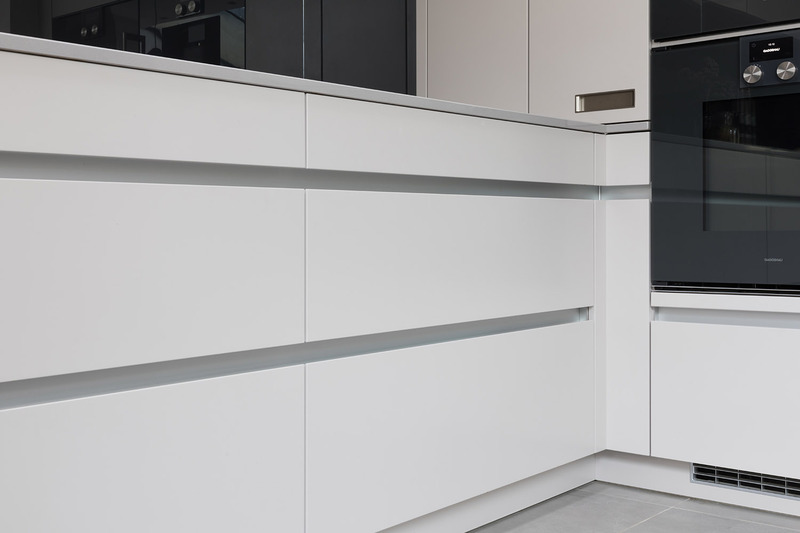 A combination of Mohair and Graphite Leicht handleless Classic FS-A Avance furniture in Silk Matt lacquer was used in the design to create a sense of space and make the island the focal point of the room. 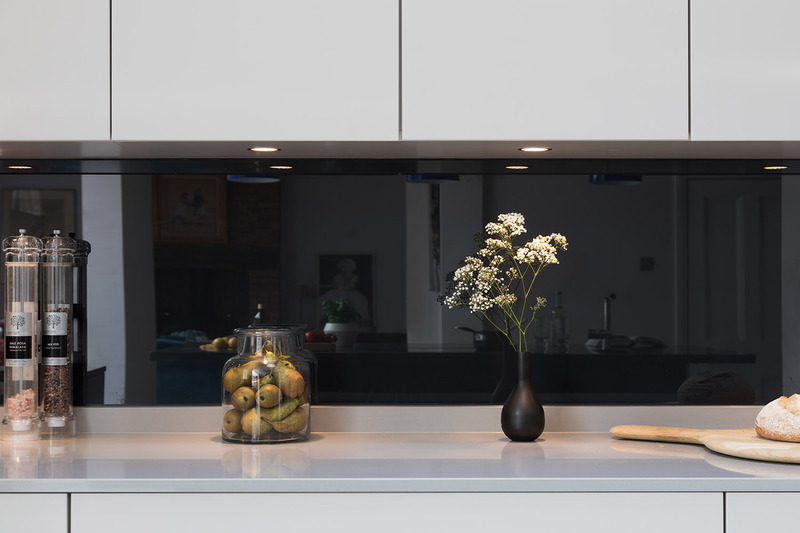 Anthracite glass was used for the splashback in order to match the bank of built in Gaggenau appliances. 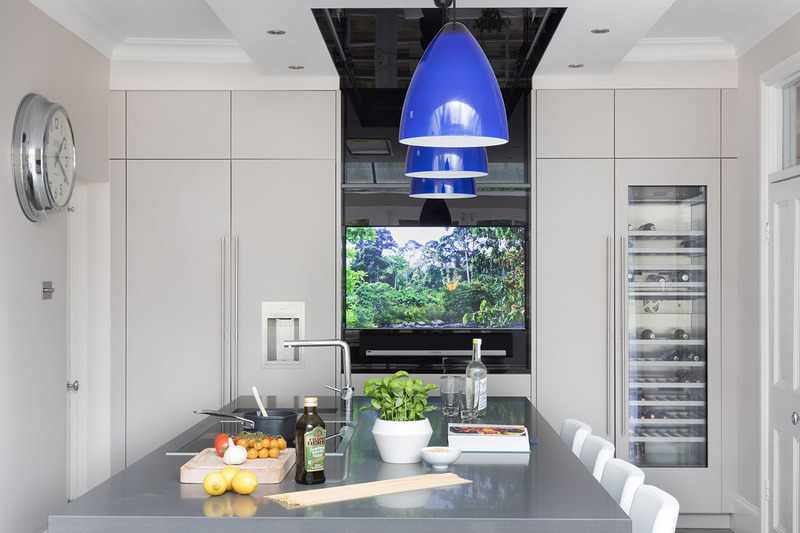 The island is linked to the tall section of the kitchen with an overhead canopy/bulkhead feature, inset glass and bespoke lighting system accent specific areas of the design and adds height and depth to the room and leads to a large TV/Multimedia area. 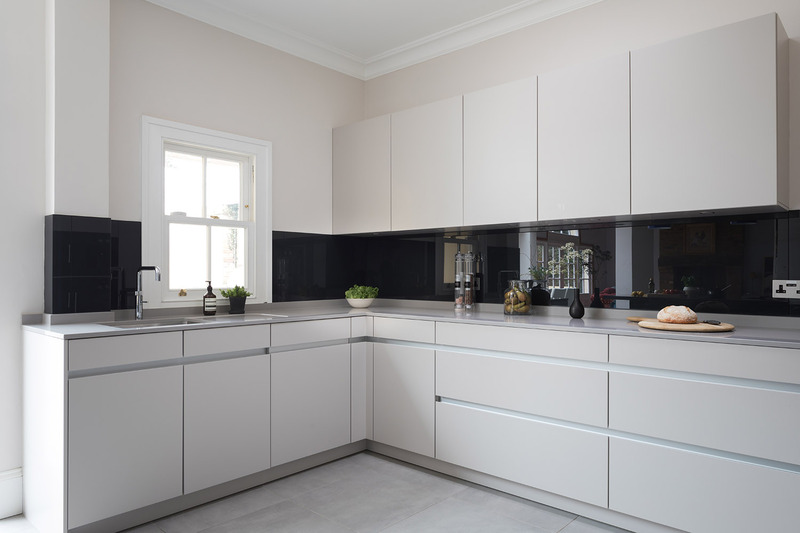 By choosing dark graphite on the island cabinetry and deep grey Silestone worktops and by mixing together reflective polished surfaces, an open plan airy feel to the design is achieved. “I fully recognise why the service you offer sets you apart from your would-be competitors, and would have no hesitation in highly recommending your company. I continue to be amazed and impressed by the quality of service you provide”.